Mac is where the most damage was done. 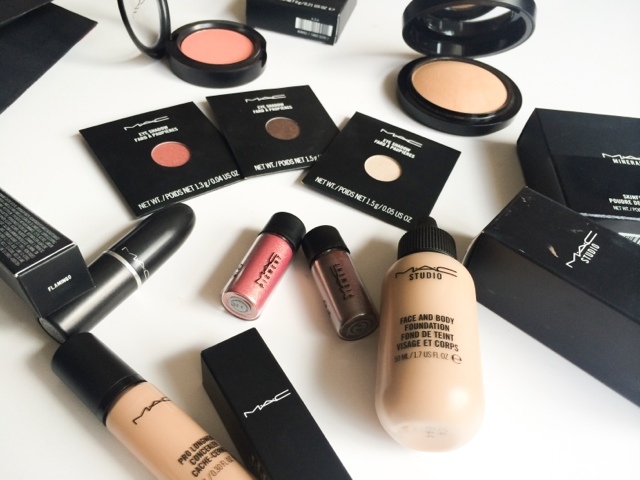 I should say I feel bad, but I don't as it seems like forever since I was in a Mac store and the whole "kid in a sweet shop" feeling swept over me like a rash, and I ended up tearing round the shop like a crazy person, picking up everything that caught my eye! Mac Face and Body foundation is a base I have heard so many people talking about and I thought it was about time I tried it for myself. The initial coverage is light but it can be built up, looking very natural and skin like on the face. Mac Mineralized Skin finish was another product everyone bar me seems to have, so of course I had to rectify that, and that was popped in the basket along with Mac Sheertone Blush in 'Peaches'. Most of you will know I'm rather partial to a coral blush so naturally this was coming home with me! I then picked up a few new eye shadows, Mac 'Shroom' - a pearlized off white shade that would be perfect for a under brow and inner corner highlight. Mac 'Club' - this is so unique, in the pan it looks nothing special - a dull greeny brown with a hint of shimmer but when swatched changes dramatically into a brown holographic shade that turns blue and green in the light. Stunning, just stunning. Mac 'Expensive Pink' - is the very similar in formula to 'club' it looks like a lovely pinky copper in the pan but again when swatched and the light hits it you can see yellow gold holographic reflections in it. Finally, no Mac shopping spree would feel right without a new lippy so naturally I picked up 'Flamingo' which is, as you can probably guess with my obsession with everything coral is a subtle pinky coral shade which of course I love already (obvs). 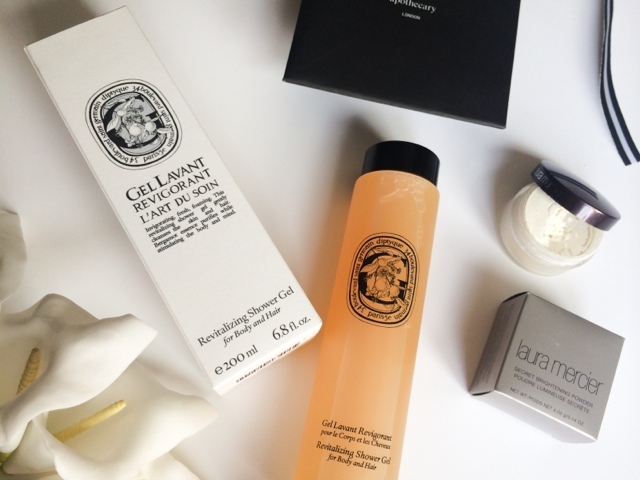 Diptyque Shower gel - this was a total impulse purchase, there's no other way to describe it! I was in SpaceNK, wanted a new shower gel and thought " that will do, I like their candles". It's possibly the most I've spent on a shower gel, £26.00 in fact, so I'm hoping to look and smell like a million dollars after using it! The Laura Mercier Secret Brightening Powder was something that I've wanted to try and never got round to buying. I haven't really tried it out fully yet but the light reflecting fine powder is designed to brighten and lift the under eye area, so I'm looking forward to seeing if it works and hopefully looking wide eyed and bushy tailed in the process! This last item was the one I was so excited about, since smelling it from a sample I had I just knew I had to have it. 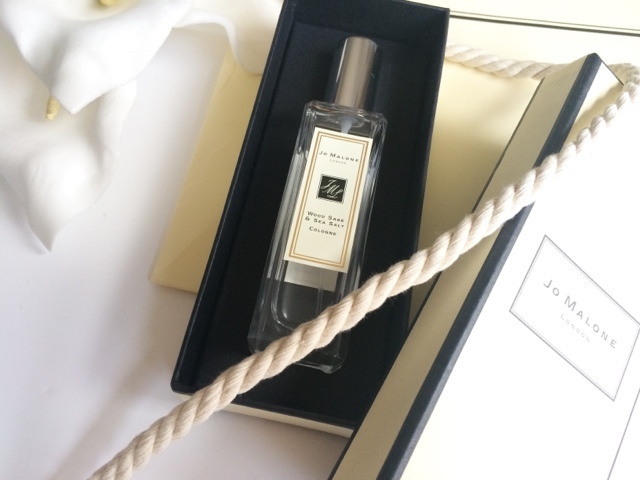 Jo Malone's lasted release is the Wood Sage and Sea Salt Cologne which smells apsoultly divine. It's in the 'woody' scent catorgory but don't let that make you think it's a strong heavy scent because its not. It's fresh and light with an aquatic feel which stems from the sea salt. I truly love this perfume and so glad that it's finally in my hands. What an amazing haul! We all deserve a little spend up now and then! I'd love to know your thoughts on Face and Body when you've used it for a while, I've been debating whether or not to try it for so long! 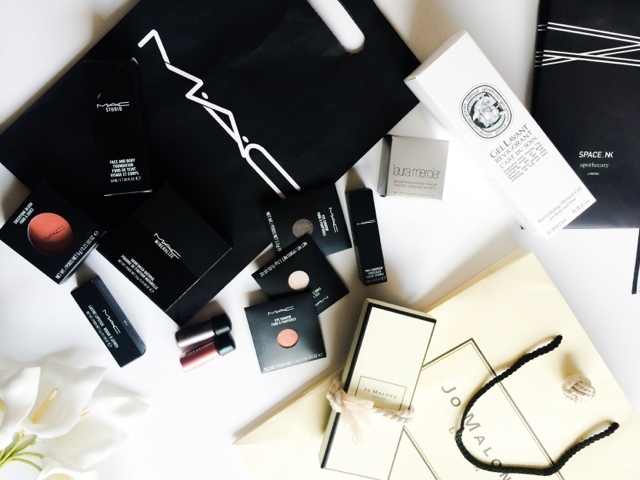 Wow, you picked up some amazing products! Mac Peaches is such a gorgeous blush shade, i love it! Great haul Lou! I just sprayed myself in the JM Wood Sage and love it! So glad it's one of the scents I can tolerate at the moment! And Club is just perfection! I just sprayed myself with the JM-bought it blind from Nordstrom as it hasn't launched here yet and I love it! So happy it's one of the scents I can tolerate at the moment-my senses have been all over the place since surgery. And Club is just divine!! Oops I commented twice as I got an error first time! !